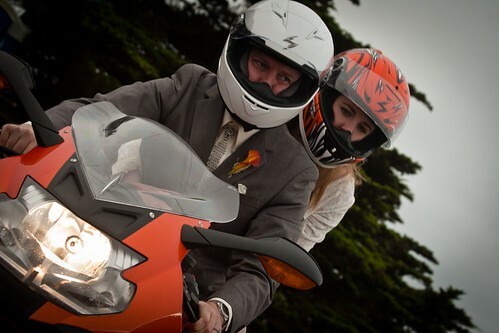 After getting married in October of 2011, Aren and Serafina decided to turn their honeymoon into a motorcycle adventure! We considered a 2 or 3 week trip to New Zealand or the Swiss Alps, but instead opted to put everything on hold and take a 6 month trip through Central and South America. Serafina is an tv/film producer and Aren is a bioinformatician (computer science + biology), but we are also both avid motorcyclists. We’ve always wanted to live on the road, and thought this was a great opportunity to see the world. Plus, Serafina’s brother and sister-in-law live in Buenos Aires, Argentina, so we thought we’d stop by for a visit! Though we had planned on 6 months, we quickly realized that in order to really see the regions we traveled through, we would have to spend a bit more time in each place. The 6 months turned into 12 months from June 2012 to June 2013, and included a trip back across the USA at the end (see our Maps page for more route details). This blog will combine everything we love: motorcycles, travel, food and each other. We will be filming much of our adventure and plan to release videos as we can. You can find all our videos at HungryRiders. Sounds like a great adventure. I am a semi-retired programmer living down here in Sucre, Bolivia for the last 10 years. If you find yourself passing through look me up and I can show you some fine Bolivian food places. Enjoy! Hi saw you on revision 3 talking about your trip, sounds so exciting! Can you tell me where you got your wedding dress?, it is exactly what i am looking for! Sorry for the off the subject question! Thanks! I got the dress from here: http://www.roxx-online.com/roxxonline/searchResults.cfm?dep_id=16&cat_id=12 – find the one labeled “Ivory taffeta & ivory velvet medieval dress”. I highly recommend them. Custom-fit, and great prices! Cool trip. I heard about this on Tekzilla. I am a fellow klr owner, I have a red 07′ also. I know your leaving soon but here is a person’s blog who is currently on a year long trek: http://othalan.net/ he is a year into it and on a klr. Good luck! You guys are too cool! I just heard about this on Tekzilla, and had to pause that video to check out this site and the Youtube teaser. My wife and I will eagerly follow your progress. What a great idea, and now is the time to do it! Be careful, best of luck, and you’ll be in our thoughts and prayers. I just read your post on ADV rider and followed the link to this site. Of course I am now eagerly awaiting your updates on this epic ride. Thaks for sharing your experiences, and you got me thinking about taking my DR-Z400 down there next year. If you’re visiting Chihuahua, Mexico, you have to stop in Creel, Chihuahua. It’s part of the “Sierra Madre”, basically its woods and mountains with really beautoful sightings and also the natives “Tarahumaras”, also you have to take a trip to “El Divisadero” or “Barranca del Cobre” wich is part of the Sierra Madre and its one of the biggest Canyon’s in Latin America, its has a view to the “baseaseachic” waterfall, also one of the bisggest in Latin America (itis impressive in Rain Season but there’s no rain right now in Chihuahua). Just take care on your trough Chihuahua, i live here and there’s a drug war going on, it’s basically drug dealer cartels vs. federal police, but just be careful and enjoy my State. Hi guys! Just stopped in to watch your videos and exciting adventures. The food bits are very Aren esp the snake meatballs. I’ll suggest trying some guinea pig in Peru. I think it is called cuy. That, and alpaca meat, grilled on the street like kabobs. I love your feisty grandma tasting wine. Where’s the motobike for that one? I enjoyed our brief chat during breakfast at the Tikal Inn. Although you have probably moved on, I think you are going to be in Guatemala for a couple weeks. You might wantto be aware of a kindred spirit I chatted with in Tikal. His name is Georg from Switzerland. You can fibd his blog at worldbiker.info. His blog is in German but you will find quite a few English posts. He is also moving through Guatmala for next few weeks before heading through Central America and points south. You and he might find it useful to exchange info. I am going to also post similar note on his blog. An American (and friend) in Puebla, who blogs and tweets as “All About Puebla”, saw your YouTube video, and posted it in various places – that’s how I found out about you. First, congratulations on your wedding and marriage – we hosted, at our house, a couple from England that spent almost 500 days on their motorcycle honeymoon. It’s such a great idea! But I’d love to add info about how you have been able to set up your volunteering gigs as you travel. Do you blog about that somewhere? Is it featured in one of your videos? You can email me with any info – might use it on the aforementioned web site, or might blog about it. Thanks! Good luck, and I hope to see you out on the road! (I ride a KLR 650 – just did a two week trip in California, Nevada and Eastern Oregon – quite awesome). We’ve been working with the Muskoka Foundation (themuskokafoundation.org), which just connects travelers with local volunteer organizations. It’s perfect for people like us, who are travelling in many different countries – they look at your resume, see what your strengths are, and figure out how you can best help at each place. Then they give you a list of volunteer organizations that are on your way and that they’ve vetted and partnered with, and you get in touch with them directly as you get close. It’s worked great for us so far! You can see more in our video “Episode 6: Liquor, Lucha Libre, and a Labyrinth” (http://www.youtube.com/watch?v=QaOHsRAZCBA) starting around 10:08. If you have any more questions, feel free to ask, and thanks for the headsup about All About Puebla! hello how are you My name is: RUBIO, the person who helped get the mechanic this afternoon, LOOK AND SOME OF THE MOVIES BY PASSING A QUI AND ARE really good, THAT’S EXCELLENT ADVENTURE, but I would invite LUNCH TOMORROW, IF IN THE MORNING PUEDE.MAÑANA SEE. Wow, wow, wow! Hi, Aren, this is Pu. Found this website from your Linkedin profile. Your journey and movie are marvelous and inspiring. I want be a rider too :). Pu sent me this link. It is marvelous. Wish I have the guts to do the same. A late congratulation on your marriage. Keep her safe. I found your blog from the Muskoka Foundation site. Very inspiring journey you two are on, glad to connect with you all! I will be following along! I’d love to do some biking one day.